Youth-led commitments to address environmental issues in Africa are central to ensuring that global responsibility for the planet is championed by future generations. UN Youth Volunteers working with vulnerable communities at risk of climate change raise awareness on disaster prevention, leaving no one behind. 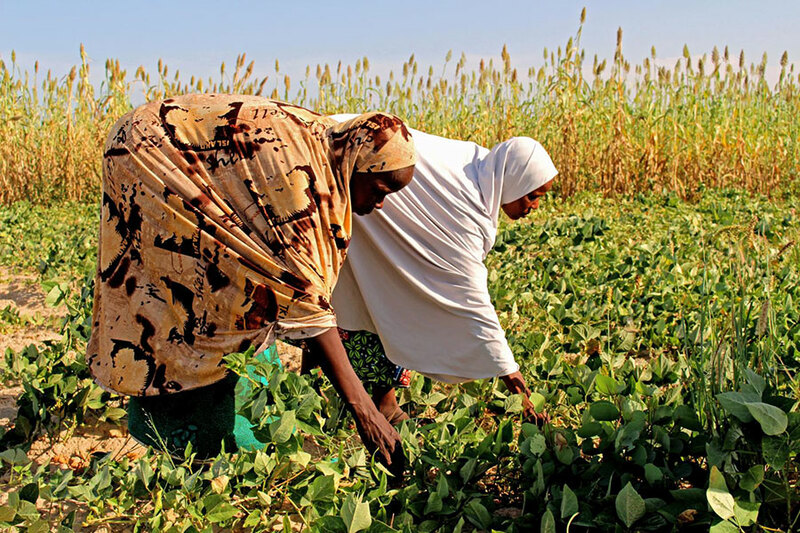 IDP women in a field of cowpea and millet grown with seeds provided by FAO during the 2016 rainy season, Maiduguri, Borno State. © FAO/Sonia Nguyen. In partnership with the United Nations Development Programme (UNDP), the United Nations Environment Programme (UNEP) and the Food and Agriculture Organization of the United Nations (FAO), the United Nations Volunteers (UNV) deployed 41 national and international UN Volunteers, 5 of them UN Youth Volunteers, to serve in environmental initiatives in Africa. Youth volunteers are the backbone of environmental action, raising awareness on climate change, responsible consumption and production, and preservation of land, forests and water resources. On the occasion of the International Youth Day, UNV tracks youth’s participation in environmental initiatives in Nigeria that reduce the country’s vulnerability to environmental disasters by actively engaging federal and state governments, development partners, UN agencies, civil society and local communities. Within his assignment with UNDP in Nigeria, UN Youth Volunteer Minjae Kang (Republic of Korea) focused on disaster risk reduction and prevention and contributed to initiatives enhancing Nigeria’s institutional capacity to respond to environmental crises in the aftermath of the heavy rains that flooded the country in 2012, causing the displacement of over 2.1 million people. Building community resilience is not a stand-alone project at a local level, but rather a complex interplay of economic development, sustainable environment, democratic governmental architecture, gender equality, reconciliation of past political struggles, and improvement of community capacity. It is expected that the frequency of disasters due to extreme weather conditions will increasingly affect Nigeria. The economy of the most populous country in West Africa, long dominated by oil exports, needs to adapt to this uncertainty as it continues the expansion of its agricultural activity. Hazardous hydro-meteorological events directly influence the agricultural productivity of local communities. Therefore, Minjae Kang's volunteer work focused on the efficiency of emergency responses by national institutions, such as the National Emergency Management Agency (NEMA), the Nigerian Hydrological Services Agency (NIHSA) and Nigeria Meteorological Agency (NIMET), to guarantee timely risk analysis and availability of information on extreme weather conditions. Through a number of workshops and trainings, we attempted to raise awareness on gender and disaster risk reduction issues [in communities] and improve women’s rights and participation in disaster reduction measures by strengthening the legal and institutional framework for gender and disaster risk reduction. Improving the skills of agrarian communities to maximize the use of arable land in a country that faces the effects of human-made pollution and land degradation is a key element of creating economic growth and sustainable livelihoods. The Chukuku community from the Kuje area near the capital Abuja was included in skill-based livelihood training initiatives that taught farmers to efficiently use limited land and resources, improve irrigation, and eventually double seasonal crop production. The project informed the community of the environmental risks posed by the application of chemical fertilizers. The 2030 Agenda for Sustainable Development and its Sustainable Development Goals have initiated an unprecedented shift in the way policymakers, businesses and citizens view global development challenges worldwide. Volunteerism is acknowledged as a key driver for a societal transformation towards responsible action and solidarity to protect the planet and the people most affected by environmental crises.